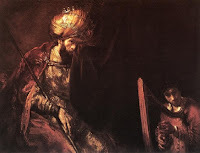 In Rembrandt, apart from a short scene or two (such as the one where the painter, on a visit to his hometown, briefly regains some of his vigour and even gets into a brawl in a local tavern), the emphasis is on the character’s discontent: his melancholia after his wife’s death and his subsequent relationship, driven by loneliness, with a shrewish housekeeper; his difficulties in dealing with the demands made by the noblemen who commission his work; his struggle with the question of vanity and where it leads an artist ("it's no greater than and no less than when a shoemaker makes a pair of shoes" he says, responding to praise for one of his works); and his nostalgia for (but also inability to return to) his humble roots in a milling family. But dominating everything is the Laughton performance, his fluid face running the gamut of emotions from frustration to quiet pride to sorrow. Incidentally his real-life wife Elsa Lanchester plays Hendrickje, the woman with whom Rembrandt finds love. She’s a fine actress but I always feel a disconnect when I see her playing anything other than the Bride of Frankenstein! Need to check out Rembrandt and Henry VIII. I used to think of Alex Korda primarily as a high profile producer - Britain's David Selznick in some ways. It is only lately that I discovered that the guy has a pretty impressive record as a director. Was particularly impressed by That Hamilton Woman - a very handsome historical drama starring a real life couple in the lead roles. It's a shame that the movie is practically unheard of when compared to several lesser Hollywood melodramas from the same period. 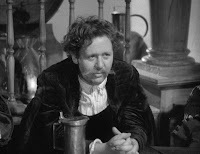 "Men of the great acting quality of Laughton and [Leslie] Howard are often accused of being themselves at the expense of their parts"
PS : Will you be there at Cinefan this time ? any recommendation on what to see? Shrikanth: I was a big Olivier fan around 18-20 years ago but got around to seeing That Hamilton Woman relatively late. It was Churchill's favourite movie apparently. "Won't judge, because I might easily do the same if someone dismissed James Stewart or Cary Grant as one-dimensional actors!)" Anyway I saw Manorma 6 feet under yesterday and came here to check your review. I wonder why you think the old woman laughing in the end and Raima's motives were unresolved. The elderly lady was Rathore's wife who has suffered and has been a silent spectator to his misdeeds.When she hears of him having cancer etc. she behaves thusly. Secondly Raima herself says that this is the only life she has known since she is 8 and she has no one but Rathore.So no ambiguities there. The one thing I could not swallow is how Raima could have passed off for her cousin.In a small town like that you can't do it even with your neighbours,let alone your brother in law and your wife;especially when she is from the same city. Rahul: I'd prefer it if you'd left the Manorama comment on the relevant post, but very quickly: what I said was that the old lady remains a peripheral character and her back-story isn't explicitly spelt out for the viewer. Your interpretation (and it's a perfectly reasonable one, though not necessarily the only one) is a case of you as a viewer filling in the gaps. About Sheetal: why take her explanation of herself at face value? I thought there was a certain amount of ambiguity in the character's actions towards the end. Sidenote: watching the beggar-as-Saul scene, a whimsical question popped into my mind. Which is truer to life – a black-and-white photograph, or a realistically coloured painting? Radhika: that's one of my favourite strips, and Calvin's dad is the greatest father in fiction. I think the world would be a vastly better place if all dads took a similar approach to "teaching" their kids.